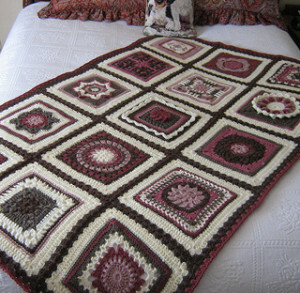 For our next Crochet A-Long on my Ravelry board and Facebook CAL page, we are going to work through November and December on an afghan comprised of my 12″ Afghan Square Patterns. 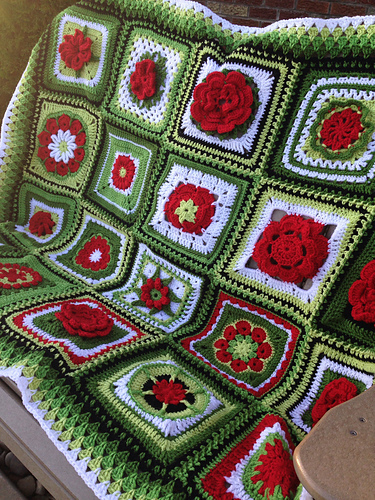 I have about 30 available patterns, a mixture of free and paid patterns, and you can choose which to use in your own personalized afghan. 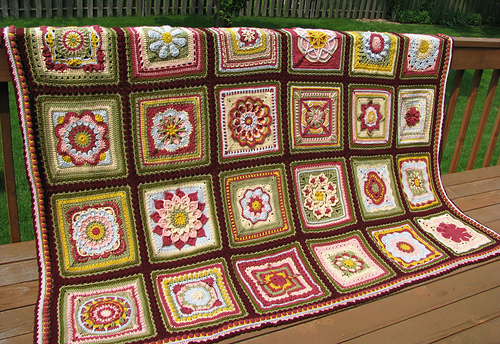 12 – 12″ blocks makes a nice large lap blanket, and 20- 12″ makes a large afghan. You can choose your own join and border method, and I will give suggestions. For today, I am going to give you some color combination suggestions. 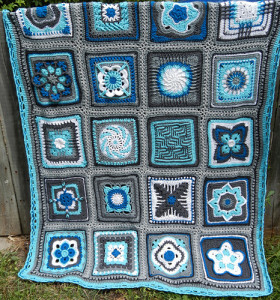 As you know I love the Vanna’s Choice Fan Club board on Ravelry, and they always have great and unique palette suggestions for their afghan square swaps. I have “borrowed” a few ideas and here are the Vanna’s Choice colors you’ll need for each. With my 12″ squares in Vanna’s Choice you need a little less than 1 skein per square, plus a couple for border, so about 14 – 22 skeins total, depending on size. 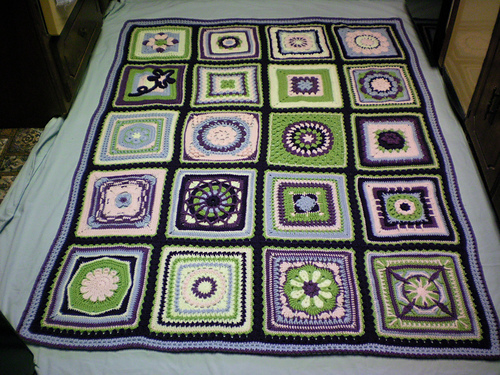 (For 12 blocks get 2 each of 6 colors plus 2 or 3 for border. For 20 blocks get 3 skeins each of 6 colors plus 2 -4 for border.) 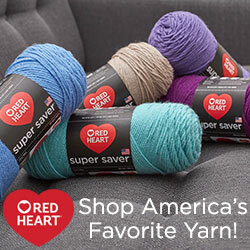 Vanna’s Choice is $2.99 per skein at joann.com this week, with a $1.99 shipping offer with purchase of $60.00, with coupon code SHIPDEAL298. . Vanna’s Choice and all aran weight yarns are 25% off at Deramores until 29 Oct. If you buy (anything)through my links or button I get a commission, thanks! Here is Bankerlady’s beautiful blanket from the Lavender for Luck swap using Pink, Purple, Dusty Purple, Silver Blue, Sweet Pea and Fisherman. This is Dakotastamper’s from the William Morris swap: Antique Rose, Pink, Beige, Mustard, Dusty Green and Silver Blue. Lissa M’s pretty Happy Dancers: Charcoal Grey, Silver Grey, White, Baby Aqua, Aqua, Sapphire. 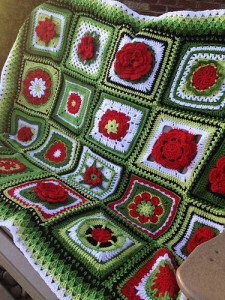 Havenodoutt’s lovely Merry Grinchmas – Scarlet, Lime, Fern, Kelly Green, Black, White. And finally, Sharonhk’s Chocolate and Roses: Chocolate, Antique Rose, Rose, Dusty Rose, Fisherman and Taupe. 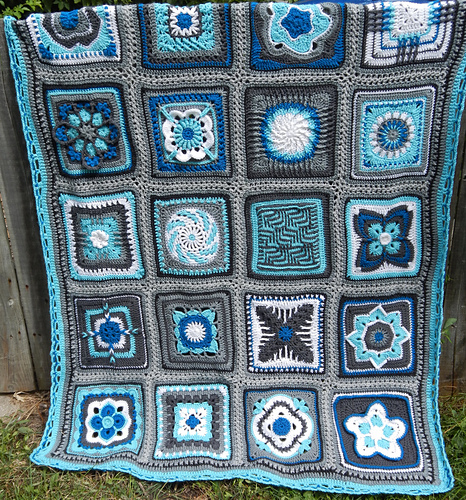 I love these combinations and thanks to the crafters who share their eye-candy with us! Disclaimer: These are not all my designs, just examples of the style and colors we are going for. We are going to be working on just my patterns. See tabs above and my Ravelry Store. 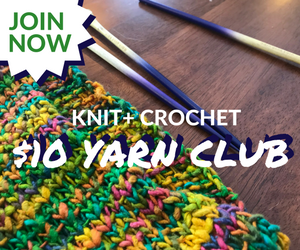 During the course of the CAL, the following squares will be added to the free section of the blog: Heart to Heart, Viva La Vida, Margaret, Loopy Dishcloth. 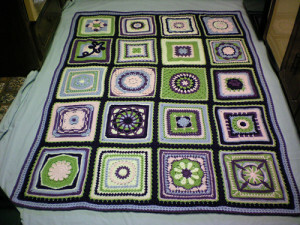 The following will have free coupon codes for a limited time: Spiral Circle to Square, Crochet Clusters. 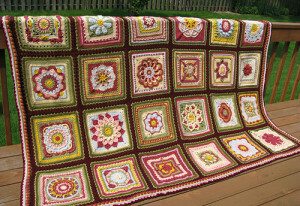 am ready for this, was going to repeat my larger square afghan in a nicer yarn now that I know I can crochet , so this would be lovely – once again thanks . I do so love your designs and have quite a few. Julie, I bought the e-book for this CAL but did not see this . May I still get this offer? If you bought the E-book, all the patterns, free and paid, are included in the E-book, just download them from your Ravelry library or with the link you received when you bought the E-book. There is no BOGO for the E-book, it is already the best value.